The following intelligence assessment was published by Foreign Policy as part of an article by Jana Winter and Sharon Weinberger The FBI’s New U.S. Terrorist Threat: ‘Black Identity Extremists’. (U//FOUO) The FBI assesses it is very likely Black Identity Extremist (BIE) perceptions of police brutality against African Americans spurred an increase in premeditated, retaliatory lethal violence against law enforcement and will very likely serve as justification for such violence. The FBI assess it is very likely this increase began following the 9 August 2014 shooting of Michael Brown in Ferguson, Missouri, and the subsequent Grand Jury November 2014 declination to indict the police officers involved. The FBI assesses it is very likely incidents of alleged police abuse against African Americans since then have continued to feed the resurgence in ideologically motivated, violent criminal activity within the BIE movement. The FBI assesses it is very likely some BIEs are influenced by a mix of anti-authoritarian, Moorish sovereign citizen ideology, and BIE ideology. The FBI has high confidence in these assessments, based on a history of violent incidents attributed to individuals who acted on behalf of their ideological beliefs, documented in FBI investigations and other law enforcement and open source reporting. The FBI makes this judgment with the key assumption the recent incidents are ideologically motivated. (U) This intelligence assessment focuses on individuals with BIE ideological motivations who have committed targeted, premeditated attacks against law enforcement officers since 2014. This assessment does not address BIEs who have attacked law enforcement officers during the course of officers’ routine duties, such as responding to calls and traffic stops, in which violent actions were reactionary in nature. • (U//LES) To what extent are BIEs’ targeting interests retaliatory? • (U//LES) What cross-programmatic relationships influence the BIE movement? (U//LES) This assessment is the first FBI analytic intelligence product to assess influences between the sovereign citizen extremist movement and the black identity extremist movement. The FBI has previously reported on BIE retaliatory violence against law enforcement in two products, both of which had findings consistent with this assessment. 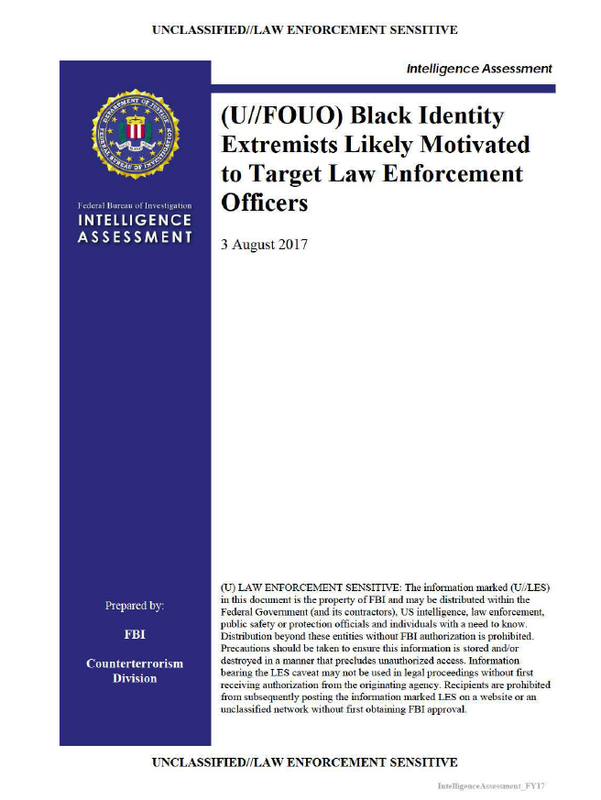 The 23 March 2016 FBI intelligence bulletin, titled “(U//FOUO) Black Separatist Extremists’ Call for Retaliation in Response to Police-Involved Incidents Could Incite Acts of Violence against Law Enforcement,” assessed incidents involving allegations of law enforcement abuse and related legal proceedings would likely lead to BSE calls for violent retaliation and incite these domestic extremists to commit violent acts against law enforcement. The 14 November 2014 FBI intelligence bulletin, titled “(U//FOUO) Potential Criminal Reactions to Missouri Grand Jury Announcement,” assessed the announcement of the grand jury’s decision in the shooting death of Michael Brown in Ferguson would likely be exploited by some individuals to justify threats and attacks against law enforcement and critical infrastructure. (U//FOUO) The FBI judges it is very likely BIE perceptions of police brutality against African Americans have become organizing drivers for the BIE movement since 2014, resulting in a spike of BIEs intentionally targeting law enforcement with violence. In all six targeted attacks since 2014, the FBI assesses it is very likely the BIE suspects acted in retaliation for perceived past police brutality incidents. Even though five of these attacks occurred following controversial police shootings of African Americans by white police officers, BIE targeting of officers was not, in every incident, based on their specific race. • (U) On 7 July 2016, Micah Johnson ambushed and shot 11 law enforcement officers, killing five, in downtown Dallas, Texas, during a First Amendment protected protest, before being ultimately killed by police. The five deceased officers were white. The planned public event was protesting recent officer-involved shootings of African Americans in Louisiana and Minnesota. Based on Johnson’s journal writings and statements to police, he appeared to have been influenced by BIE ideology. o (U//FOUO) During the standoff with police, Johnson told police negotiators he was upset about recent police shootings and white people, and expressed a desire to kill white people, especially white officers. Johnson searched and liked social media pages of BIE and black separatist groups, and had been ousted from a local BIE group for being too radical, according to an open source news article. • (U//FOUO) On 23 October 2014, Zale H. Thompson attacked four white New York Police Department (NYPD) officers in Queens with a hatchet. One officer received injuries to the arm and a second officer received an injury to the side of his head. The two remaining NYPD officers at the scene shot and killed Thompson according to open source reporting. o (U//FOUO) According to open source reporting, Thompson was angered after “a recent spate of deaths at the hands of the police.” In his own writings, Thompson advocated for armed struggle against “the oppressors” and “mass revolt” against the US social, economic, and political systems, which he perceived to be “white dominated.” He also described the United States as a “beast” and called for “chopping off” its head, hands, and feet. NYPD observed tattoos on Thompson’s body that indicated he was affiliated with a black separatist extremist group and pocket litter indicating he may have been associated with another black separatist group according to law enforcement reporting. (U//FOUO) The FBI assesses it is very likely that BIEs’ perceptions of unjust treatment of African Americans and the perceived unchallenged illegitimate actions of law enforcement will inspire premeditated attacks against law enforcement over the next year. This may also lead to an increase in BIE group memberships, collaboration among BIE groups, or the appearance of additional violent lone offenders motivated by BIE rhetoric. The FBI further assesses it is very likely additional controversial police shootings of African Americans and the associated legal proceedings will continue to serve as drivers for violence against law enforcement. The FBI assesses it is likely police officers of minority groups are also targeted by BIEs because they are also representative of a perceived oppressive law enforcement system. (U//FOUO) Possible indicators for BIEs posing a violent threat to law enforcement include advocating for violence against law enforcement, violent anti-white rhetoric, attempts to acquire illegal weapons or explosives, and affiliations with others in both the BSE and sovereign citizen extremist movements.